Think purchasing a portable oxygen concentrator is a once-and-done transaction? It’s not. If your unit alarms or malfunctions, your first thought might me to call the manufacturer. The problem is you are not their customer; the dealer is. Therefore, the manufacturer will usually provide only limited assistance and they will refer you back to your dealer. If you do not know who your dealer is, they will be able to tell you if you give them the serial number on the unit. It’s a little bit like purchasing a car. You never buy a car from the manufacturer directly; always from a dealer. When your car has problems the manufacturer will not provide any assistance. You have to go back to the dealer. However, unlike an auto dealers who can handle warranty work no matter where you bought your car, a portable oxygen concentrator dealer can usually only help with warranty service for units they sold. The reason is that many manufacturers will only accept a warranty claim from the original customer which is the dealer that bought the unit from them. There are exceptions, of course. Invacare and Respironics are very willing to allow any authorized dealer handle a warranty claim. SeQual, Inova, and Oxlife are fairly willing. AirSep and Inogen are sticklers, and rarely allow anyone but the original dealer to request warranty repair. If your dealer is helpful, then you have no worries. However, if your dealer is out-of-business, or rude and unwilling to help with your warranty repair, you may have a hard time finding a another dealer to help. Since dealers make no money by requesting warranty repairs, many are unwilling or financially unable to assist anyone but their own customers. Some are willing to help people in a bind and may help for a reasonable flat fee and shipping charges to cover the cost of their time. Still others will charge exorbitant prices for shipping. What does all this mean to you? A good dealer is the key to continued satisfaction with your portable oxygen concentrator purchase. The company is an authorized dealer for the manufacturer. The company is a highly rated member of the Better Business Bureau. The company specializes in portable oxygen concentrators. “Big box” medical supply companies may have lower prices, but often provide poor service. The company has business longevity. There are no guarantees that a company won’t go out of business, but long-established businesses are usually a safer choice. The company has non-pushy sales people. Sales people who are more interested in helping you make the best choice than in their next commission check are usually backed by a company that cares more about customers than sales quotas and are probably more willing to provide future support. The company can supply a loaner unit for you to use while your unit is being repaired. I haven’t examined all of the online dealers, but I do know that OxiMedical.com meets the indicators I have listed and is a company I would recommend. However, unlike Lincare, internet dealers do not bill Medicare so you can expect to pay out-of-pocket. The Inogen One G3 is a pulse only unit and does not offer a continuous flow setting. The lightest POC that has continuous flow settings is the Respironics SimplyGo; it is 10 pounds. Liquid oxygen works well for people who do not travel far from home; however, you would have to contact a local homecare provider for liquid oxygen since it cannot be shipped by an online retailer. Medicare pays a fixed amount per months for stationary and portable oxygen. All portable concentrators are Medicare approved; however, your provide does not receive any more money for a portable concentrator as they would for a home unit and oxygen cylinders. So the question is not what Medicare approves, rather what your homecare provider can afford to give. The fact that you have any portable concentrator is a rare advantage. 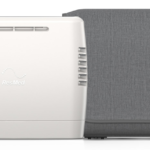 Do you need a continuous flow unit with your CPAP because you travel? If you do not travel, then you are best off using your home concentrator with your CPAP and keeping the small XPO2 for day use. Portable concentrators that provide a continuous flow option will be larger and heavier than the XPO2. The smallest is the Respironics SimplyGo, which is 10 pounds and provides up to 2 LPM. If you need 3 LPM, then the unit would be 18-20 pounds. I just received my Inogen One G3 after having owned a G2 for four years and have rented other POCs for several years before that. I am sooo disappointed. I didn’t do any research on the G3 as I have been fine with my G2. I can’t believe they made one that has this very annoying purging sound. What were they thinking? I have a POC to go places. I don’t want to sit in church or a theater or any group and be a source of annoyance to all around me (not to mention my own annoyance at the sound.) I have already cried and feel near tears again and if I go to church tomorrow and somebody asks what is that noise, I don’t know what I’ll do. I wanted it for the small size. I saw someone with one, but I didn’t hear the loud popping noise as I spoke with him. It was in a noisy restaurant. I guess I’m mostly just bending your ear. Do you know if Inogen has any fix for this yet? My ear does not mind being bent. 🙂 I know it can be disheartening to receive equipment that you do not like. I noticed you commented on my post about why your dealer is so important – your story is a perfect example why it is important to find a good dealer. Did you purchase the unit on your own? If so, does the company have a return policy that is not too cost-prohibitive? Hopefully, you can exchange it for the much quieter Inogen One G2 that you have used before. Unfortunately, I have not received any news about Inogen addressing the noise issue. It seems to be quite popular even with the noise that I am not sure Inogen has reason enough to make the change until a competitive POC comes on the market. I need to start using night time oxygen at 2 liters. We travel to people homes frequently. The Invacare Perfecto2 is 41 pounds and the heaviest of the model you mentioned. 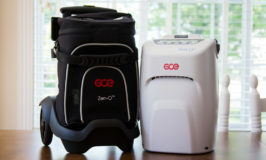 The SeQual Eclipse is the lightest (18 pounds), but it will also be much more expensive since it is a portable oxygen concentrator. The EverFlo Q may be the best choice. It is 30 lbs, so much lighter than the Perfecto2, and is very quiet (the Q stands for Quiet). Another model that won’t be as quiet, but that is much easier to travel with, would be the Respironics SimplyFlo. This ia a travel-sized home concentrator. It weighs only 8.5 pounds and provides up to 2 LPM. I am so glad to have found this site since my Husband is on oxygen with a concentrator at home and we are discovering portable concentrators We had no idea this was offered and am excited to read about the Inogen One G2. This is so exciting to find out that his other options are not just canisters. I am going to research this but think this is the most positive idea that we have discovered in the last 8 years. Thanks for the information and if you have any other options please let us know. a few months ago i had a sleep study, my second one, and is stopped breathing 22 times in an hour. and the pulmonary doc said i had severe sleep apnea and needed a cpap. so he notified lincare whom i already use for an oxygen concentrator. my blood oxygen level dropped during surgery when i had knee replacement, so my dr. said i needed to use it every night, so i have for the last like six years. now this oxygen machine will be paid for through my united healthcare ppo plan with the state of il. so when it is paid for along with my co pay each month, they will want to right away get me a new one to get that five years of co pays, and it is up to 34.00 for both the oxygen and the cpap machine. so if i refused a new machine and kept the one that was paid for in another month, will they come out if i pay them a fee every few months to check it for me and give me tubing, etc as i need it, or would it be more economical to just buy tubing online? or am i going to have to go into another five year payment program again for another machine when the one i have is fine? Unfortunately, I am only knowledgeable about the equipment and do not know the details of billing, especially with individual health insurances. I recommend you contact your homecare company and ask them what they will do and what your options are. Have you heard of any complaints regarding a whining/buzzing noise in the ear when using Inogen continuous flow oxygen. I recently switched from another brand which put out a lot of heat and was very heavy; however, I never heard anything in my ears (whether breathing, or swallowing, etc). With the inogen, I hear a soft continuous humming, that increases to a loud buzzing if I swallow, or cough. It almost sounds like an apnea alarm, although this is not in the manual. I can hear the noise if I take it off and hold the cannula near my ear. I have switched tubing several times. I know this sounds crazy, but it is driving me nuts! Other wise, I love the fact that the temperature in my bedroom remains almost the same, instead of the increase from the older machine. Yes, I have heard of this complaint. It is caused by the high pressure of the oxygen being forced through a narrow cannula. Switching to a high-flow cannula should resolve the issue for you. I am not sure what you mean by “your unit.” I don’t sell equipment so I don’t have any units. If you’re asking about other units meeting your needs, there is a new Inogen One G3 model that provides up to setting 5 and is noticeably quieter. All of you adapters, batteries and accessories are compatible with the new G3. It sounds as if Inogen is your oxygen provider so you may want to ask them about the new version of the G3. As for other brands, the Philips SimplyGo Mini also provides up to setting 5 and is quieter than your unit. However, it is the same weight and size and none of your accessories would be compatible. For pulse settings up to 5, you won’t find a unit lighter than the 5-pound unit you already have.